Druzy is created with tiny crystals clustered atop a precious stone, giving it texture and sparkle. Funny name, serious style. 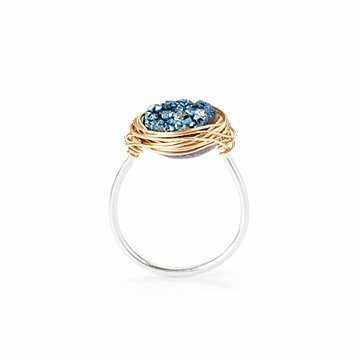 Nestled in gold-filled wire wrap on a sterling silver band, Laura Jackson's shimmering druzy gem stands alone or stacks with a few delicate bands for a glamorous upgrade. The unique look is created with tiny crystals clustered on top of a precious stone, giving it texture and magnifying its glittering qualities. Handmade in Pennsylvania. Do not wear in shower or pool. Beautiful ring, slightly on the larger side for a size 6. My ring finger is usually ~6.25 - 6.5, and this ring is a bit big.